To say Jessica (Carmichael) Bolinger put Wayne County on the state women’s softball map is not an overstatement. Known as Jessi Carmichael during her playing days, when she enrolled at Dalton no school located in Wayne County had ever won a state softball title and there had been few Div. I college players from here. By the time Bolinger finished her playing career, she had led Dalton to back-to-back Div IV state titles in 2006-07 and became one of Kent State’s all-time greats. As a Golden Flash, Bolinger graduated as the program’s career leader in home runs (36) and RBIs (132), while ranking third in hits (179) and doubles (38). The infielder was named first-team All-Mid American Conference as a sophomore, earned second-team honors as a junior and started her career by being named to the MAC All-Freshman team. As a freshman in 2008 she played on a Kent State team that won the MAC title and played in the NCAA Tournament. Bolinger had one of the greatest high school softball careers in area history, pitching Dalton to a 1-0 win over Triad in the 2006 state title game and then working with teammates to repeat by topping Triad again, this time 3-1, in the 2007 championship. A three-time Daily Record Softball Player of the Year, Bolinger set a state record for all divisions at the time with 15 strikeouts in the title game as a senior and fanned 13 as a junior. In four career state games, she was a combined 4-0 with 46 strikeouts, five walks, 13 hits and just six runs allowed in 26 innings pitched. uring a dominant senior year at Dalton on the mound and at the plate, she was 19-2 with a 0.49 ERA and 292 strikeouts, while batting .485 with two home runs, 26 runs, 18 RBIs and 11 stolen bases. Bolinger lives in Wooster with her husband, Zach Bolinger, and their daughter, Brynlee, who will be 1 in July. 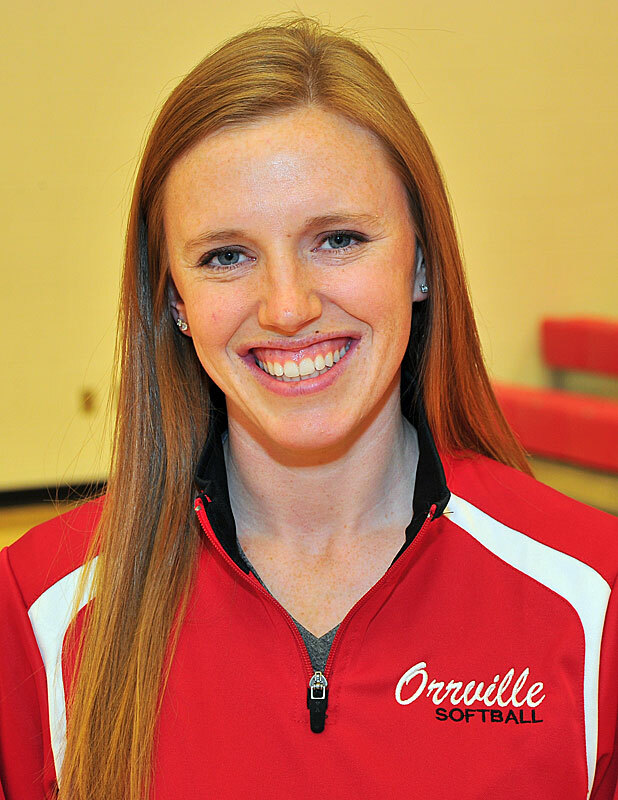 She is a logistics coordinator for PackShip USA in Orrville and the Red Riders’ head softball coach.